Introduction: The word linoleum comes from the Latin linum (flax) and oleum (oil). Linoleum is used in the creation of relief prints, the oldest form of printmaking. 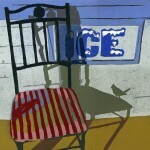 A design is cut into the linoleum using a variety of gouging tools. The gouged areas are recessed while the uncut areas are raised. The raised areas of the linoleum are inked with a brayer. Then a sheet of paper is laid over the inked linoleum and the design printed either by hand or using a press. What is linoleum? Authentic linoleum is made from linseed oil, ground cork and organic binders. 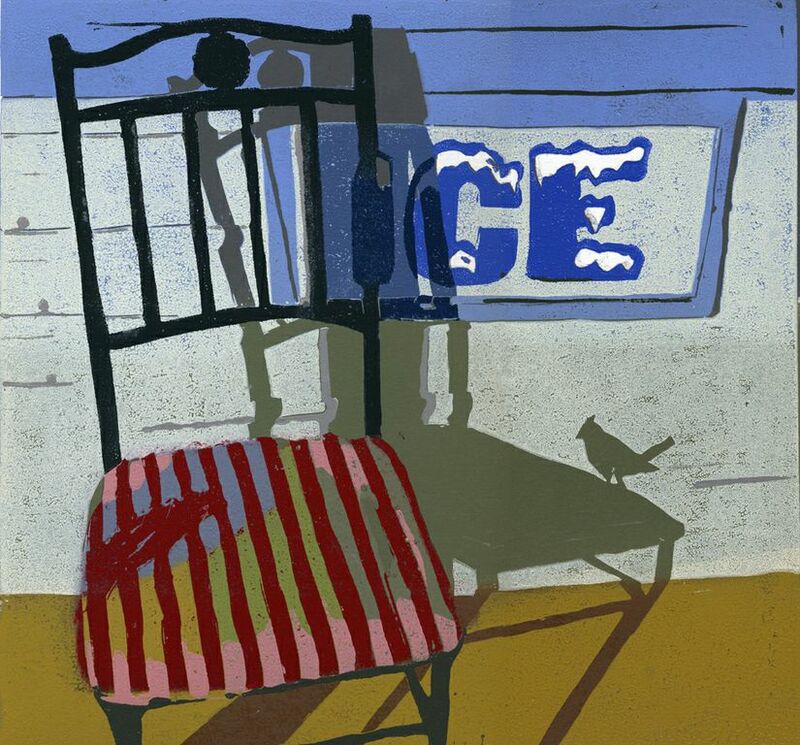 Today, linoleum is used as a floor covering as well as a substrate for relief printmaking. How safe is linoleum as an artist medium? Because true linoleum is made from natural ingredients, it has non-allergenic properties and is non-flammable. Can linoleum be purchased from a floor covering store? Large quantities, i.e. by the yard, can be purchased at floor covering stores under the trademarked name of Marmoleum. Artist grade quality linoleum, in smaller mounted or un-mounted formats, can be purchased at arts and crafts stores. Aren’t all floor coverings called linoleum? Yes, but it is a misnomer. The word, linoleum, is a generic term used to describe most floor covering materials including the synthetics. Most flooring is made from vinyl, a synthetic and is unsuitable as a printmaking substrate. 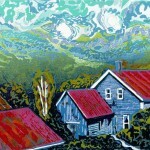 Why is linoleum an excellent substrate for relief printmaking? Linoleum has no natural grain unlike wood. It is inexpensive. Linoleum is easy to cut and gouge because it is very malleable and has a natural softness to its make-up. 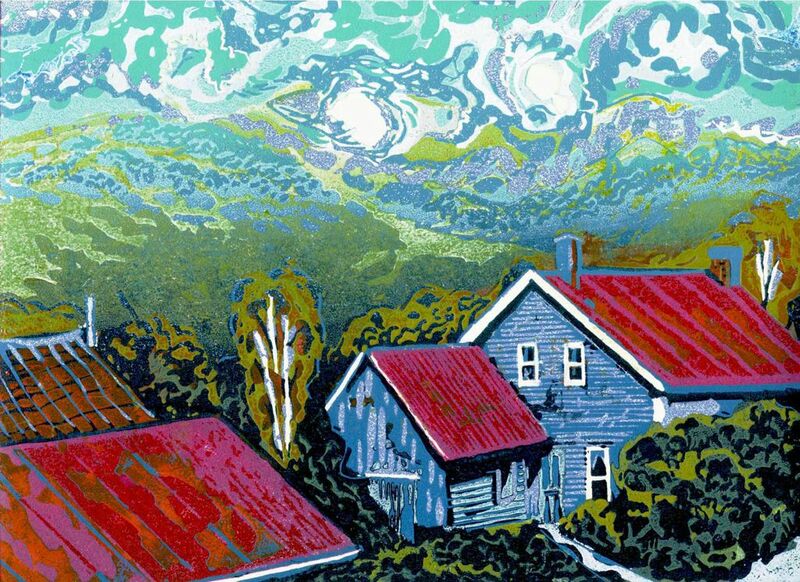 Susan Jaworski-Stranc, Red Roofs of Vermont, Linoleum. Are there different grades of linoleum available? Linoleum is manufactured in various thicknesses from 1/8” -1/4”. Why is linoleum available in mounted and un-mounted formats? Thin linoleum is mounted on wood such as plywood, Masonite or heavy cardboard. Mounted linoleum is best used when rubbing by hand or with a baren to transfer an image to paper. The thickest linoleum known as ‘Battleship Gray’ is hardwearing and can be run through a printing press, un-mounted. What type of adhesives can be used to mount linoleum? Woodworker’s glue and white glues such as Elmer’s and Sobo are excellent adhesives for mounting. Because of its flexibility, a vinyl adhesive is applied if the boards are to be recycled/re-used for future re-mounting. What tools are used to cut linoleum? Electric tools such as drills and a Dremel are used for unique mark making. Caustic soda (sodium hydroxide) can be used as an etching agent. Toxic. Are there any health risks from warming linoleum for ease of carving? there are no known health risks associated with warming linoleum to regain subtleness. 1860 Linoleum was invented by an Englishman, Frederick Walton as an inexpensive, durable and flexible floor covering. 1890 Franz Čisek, Viennese art educator first introduces linoleum as an artist material in the teaching of printmaking to school age children. 1890 a German company began using linoleum for the printing of wall paper. 1903-13, Erich Heckel and the German Expressionist group called Die Brüke was first to use linoleum as an art print form. 1917, Soviet artists of the Russian Revolution produce many abstract works in linoleum as part of the Agitprop movement. As an inexpensive alternative to wood, linoleum was used in the commercial printing of book illustrations and posters; hence why the terminology of ‘type high’ is used in describing mounted linoleum. 1937-52, Henri Matisse created 70 linocuts including book illustrations for many publications. An example is de Monterlant’s “Pasiphae”. 1952, Pablo Picasso is introduced to linoleum by the commercial poster printer, Arnerá who was making linocut posters for the re-opening of a bullring. In 1958, Picasso made his first linocut in print form rather than in poster form. During the ten year period, 1952-62, Picasso produced 24 posters and 107 linocuts. Jute is a long, soft fiber used for linoleum backing, providing strength and dimensional stability. Grown in India and Bangladesh, jute is the world’s most produced vegetable fiber after cotton. Linoleum’s anti-microbial qualities can be credited to linseed oil, which naturally repels germs and pests. Linseed oil is a clear to yellowish oil obtained by pressing flax seeds. When the oil is oxidized, a cement results that forms the basis of linoleum.